November 16, 2015 By Tina M 5 Comments This post may contain affiliate links. Read my disclosure policy here. and had so much fun with them that I ordered another set! These make great gifts, stocking stuffers, or even a service project! How fun to get a group of people together to paint these and then give them to children in need! *Keep in mind all of these photos were taken before I glossed them, and they still turned out way cute! You don’t actually have to gloss them, but it will probably make them last longer. I knew I would be glossing at night, and I wanted to take the pictures while the sun was out! Let’s start with the most basic of basic. If you wanted to kick out a bunch of them in a very short amount of time, you could simply paint the bodies one basic color and make two dots for eyes. You need zero crafting experience to make them, and you could do probably do all 50 in an hour. 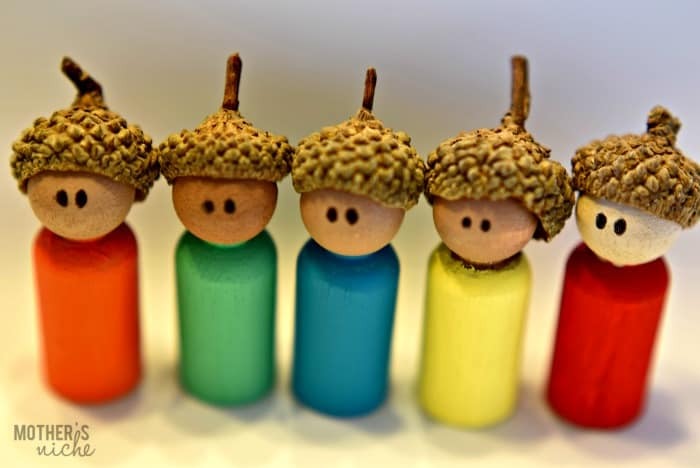 These little peg doll boys below were by far the easiest to make, and I added little acorn hats on their heads, but it’s totally optional. They are cute without too! Start with the Skin. Start with your bottom layer (skin) and then continue painting each layer, with the eyes last. Shake Your Paint and Paint From the Cap. I always tried to squirt small amounts of paint onto my pallete, but I still ended up wasting lots of paint because peg dolls require very little amounts of paint. Take off the lid from your paint and use the paint that is in there. You should have plenty of paint doing it that way. Use a pencil for details. I just kind of eye-balled mine because I wasn’t being too picky about how they looked (they are for a 2 and 4-year old), but if you want to make sure your hair styles and little details turn out just how you want, lightly draw them with pencil first. Mixing browns. I bought a few different flesh/brown colors and then did some color mixing so that I could have several options for skin color. This will save you from having to buy lots of different colors if you are wanting them to have different skin colors. 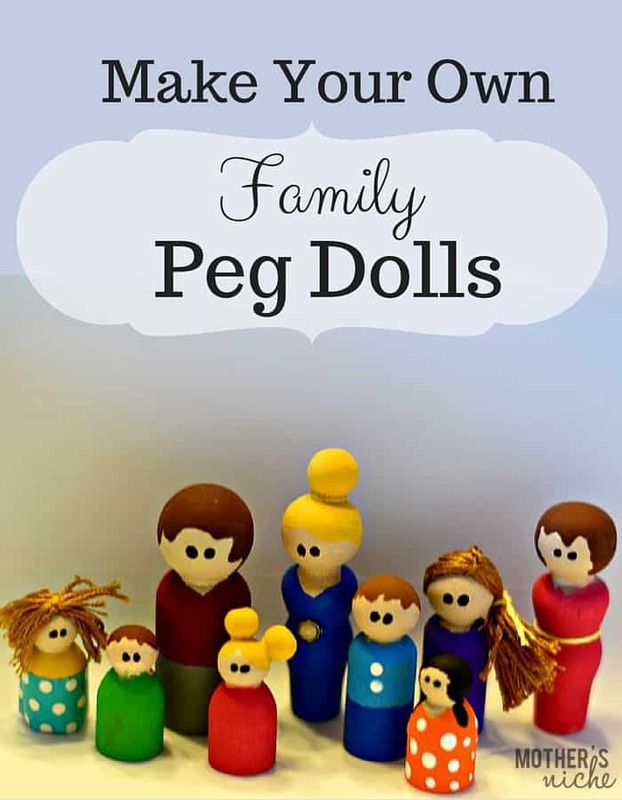 Next I made some family peg dolls. These were also very easy, as I didn’t get to intricate with design. You’ll have to excuse the dad, I thought I had run out of wooden peg dolls, and then I found one and quickly painted him at 1:30 am. His hair needs an extra coat 🙂 For the hair buns, I just glued on some small beads. You can also use washi tape or patterned duct tape for clothes if you want a patter but don’t want to have to paint the design. The girl in the orange polka dots was painted, and the girl with the blue polka dots is actually patterned duct tape. 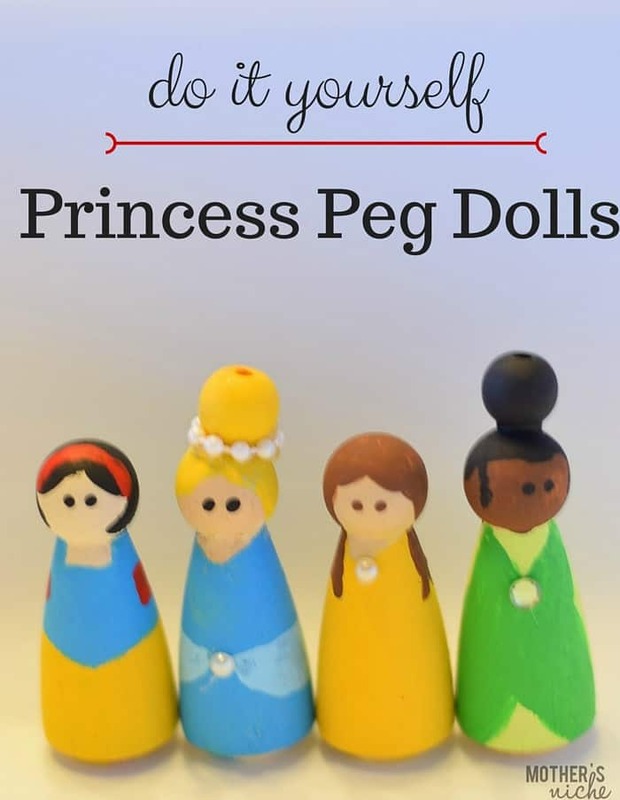 I couldn’t end the night without starting some princess peg dolls! Again this was about midnight, so I probably should have done a better paint job, but after doing lots and lots of peg dolls, I just wanted to hurry and make these ones. I was just so excited and didn’t want to go to bed until I made some princesses! I will probably go back and do some touch-ups tomorrow. Aren’t they so fun though? 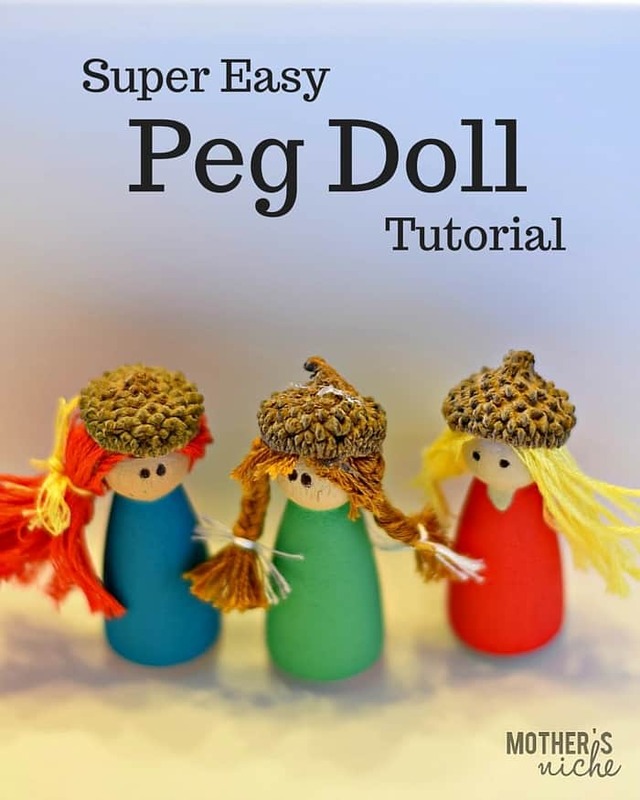 Making my own peg dolls is my new obsession. I’m going to do some cute animals tonight (and try to get to the glossing as well). The best part? I put one kid down for a nap and put the other one in front of a movie while I painted my first 4 peg dolls (thinking it would distract her), and she came into the kitchen while I was painting. She walked straight over to my bag of BLANK PEG DOLLS and played with them for at least 40 minutes! There’s proof that you don’t have to make these fancy for your kids to enjoy them! She enjoyed them before they had a speck of paint on them! I can’t wait for Christmas morning when she gets to see all the different ones I have made since then! Thanks for the great idea…love these! Ready to tackle these! So adorable and i love all your ideas! Thanks so much for sharing. We sponsored a family for Xmas and one of the kids asked for a dollhouse. 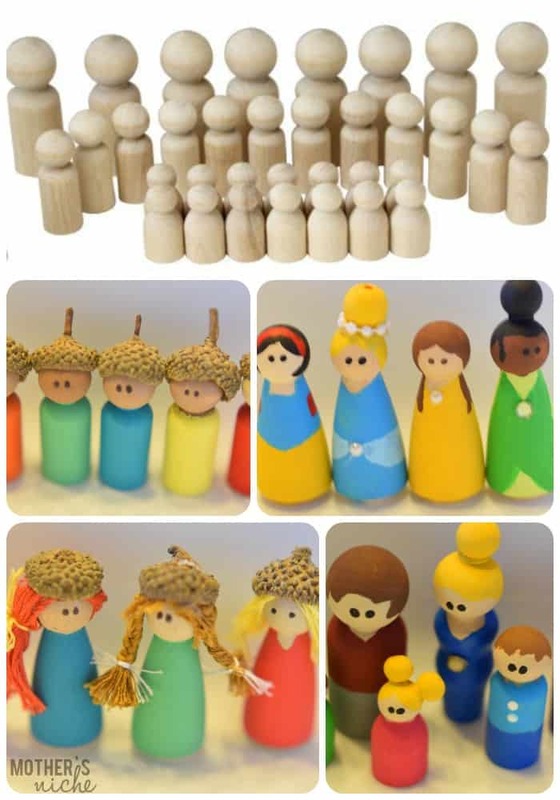 We couldn’t find people small enough for the one we bought, but when we saw this, we decided to paint dolls for each of the kids and one for each member of our family as a special gift. It’s made the experience even more personal and special and the kids will have something to remember us by and know they are cared for.